Hello! My name is Cairill/EPICflygon/NotFlygon I was a known Vanar deckbuilder awhile back who could build defining builds but lacked the needed skill to pilot them at high levels. 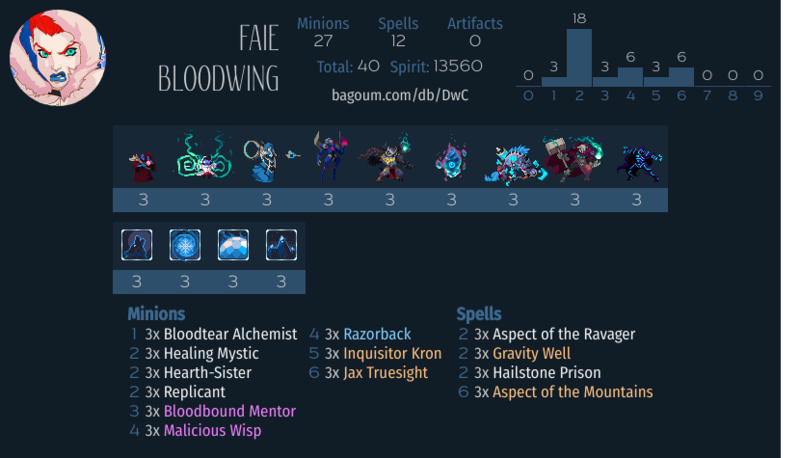 However I did infact have the needed experience to play this deck effectively. This is the natural proggression of my last version of Midrange Vanar that I took to MeltdownTown League and went 6-0 before dropping after tilting and losing intrest in the game. 3 Cloud Callers where taken out and 3 Aspect of the Mountains where put in as we found out that it is the best card in Vanar. Midrange Vanar focuses on control the speed of the game with cards like Gravity Well and Malicious Wisp to give you situations where you can get Jax Truesight on board and then wail on your opponent with Razorback the next turn. This deck is also heavily about managing your hand a replacing effectively to out value and/or out grind your opponent.